Poisoned Pen Press, 9781464202179, 236pp. A brutally murdered family man without an enemy in the world. A box full of charming letters home, written a century ago by an unknown female worker at the famed Tiffany studios. Historic Green-Wood cemetery, where a decrepit mausoleum with stunning stained glass windows is now off limits. Suddenly, all of this is part of Erica Donato's life. Erica is a youngish single mother of a teen, an oldish history grad student, and the lowest person on the totem pole of the history museum where she works. Soon secrets begin to emerge in the most unexpected places. An admirable life was not what it seemed, confiding letters conceal their most important story. All set against the background of the splendid old cemetery and the life of modern Brooklyn, the stories of old families and old loves with hidden ties merges with new crimes and the true value of art. Triss Stein is a small-town girl who has spent most of her adult life living and working in New York city. This gives her the useful double vision of a stranger and a resident for writing mysteries about Brooklyn, her ever-fascinating, ever-changing, ever-challenging adopted home. 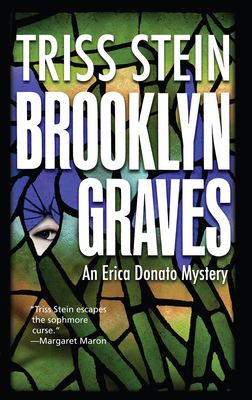 Brooklyn Graves is the second Erica Donato mystery, following Brooklyn Bones.""